Late 19th- or early 20th-century blind- and gold-tooled black morocco by Zaehnsdorf with arms on top cover (argent, on a bend azure (?) three buckles or) and bottom cover (azure (?) six stars argent). John Addam; Edward Banyster; Bernard Quaritch, Ltd., London; Archibald Stirling of Keir (1867-1931); purchased in Jan. 1957 from Lathrop C. Harper, New York for William S. Glazier (1907-1962), New York; deposited in the Pierpont Morgan Library by the Trustees of the William S. Glazier Collection in 1963. 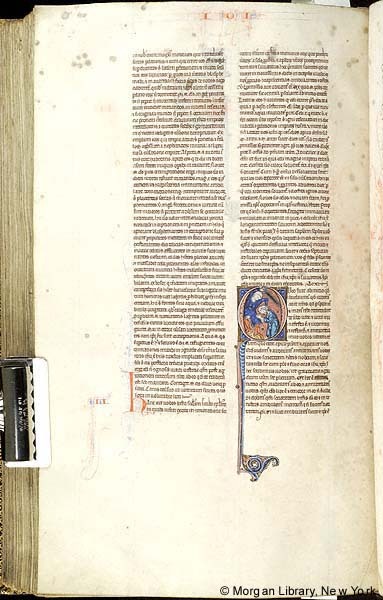 Ms. Bible; written and illuminated in England, perhaps Oxford, ca. 1265. Includes interpretations of Hebrew names. Decoration: 85 historiated initials, 2 marginal figures.